The Research Vessel (R/V) Weatherbird II and the Research Vessel (R/V) W.T. Hogarth homeported on Bayboro Harbor at USF College of Marine Science, St. Petersburg, Florida. • Our 11-acre waterfront campus is the heart of one of the largest marine science hubs in the country that also includes the USGS St. Petersburg Coastal and Marine Science Center, the NOAA National Marine Fisheries Service, the Fish and Wildlife Research Institute, the Florida Institute of Oceanography, SRI International, the Tampa Bay Estuary Program, and the US Coast Guard. • We have been a leader in innovative and cross-disciplinary oceanographic research and resource management, graduate education, and public outreach for more than 50 years. • We offer M.S. and Ph.D. degrees in Marine Science, with concentrations in Biological Oceanography, Physical Oceanography, Chemical Oceanography, Geological Oceanography, Interdisciplinary, and Marine Resource Assessment. 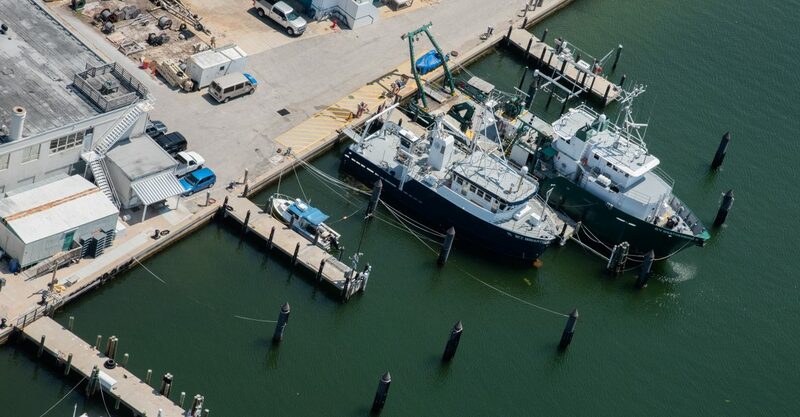 • We have two major research vessels, including the new state-of-the-art R/V W.T. Hogarth (and smaller boats managed and operated by the Florida Institute of Oceanography and CMS). • $20 million / year in research funding. • The USF CMS has been the lead institution of global research program developed in response to the largest marine oil spill in history. • The USF CMS is a major research and economic engine for the St. Petersburg Innovation District, a regional center of excellence in education, marine science, healthcare, and entrepreneurship. • The USF CMS is a recognized leader in the public understanding of science. We are proud of our strong suite of long-running education outreach programs, including the Oceanography Camp for Girls, teacher training programs, the St. Petersburg Science Festival, the National Ocean Science Bowl for High School students, and more. • The USF CMS is proud of its $20 million endowment, which supports more than 26 student fellowships ($10-25K/year). Most students receive some kind of financial support from fellowships, grant funding as a research assistant, or college funding as a teaching assistant. • We appoint ~50 Graduate Assistants every year. • More than 85% of CMS students find employment in their field of training. • Our faculty and staff are dedicated to supporting the needs of our students, who enjoy a culture of community and support. We have a 4:1 student to faculty ratio (25 faculty, 100 students). • Our student body publishes nearly 45 publications every year and typically brings in over $200,000 in research support through competitive proposals to federal, state, and other national and local organizations. • The USF CMS provides robust training and professional development opportunities in science communication, teaching, and outreach. • Our highly productive, award-winning faculty includes members of the American Association for the Advancement of Science, National Academy of Sciences, National Academy of Inventors, American Geophysical Union, and more. • We offer students several “add-on” educational opportunities including graduate certificate programs in Marine Science Education, Port Sustainability / Coastal Sustainability (coming soon).